If you are looking for an easy, affordable way to build or maintain a watering system for your turf, shrubs or plants you need to consider using a drip irrigation system. This type of watering system allows a slow drip of water, which permeates right to the roots of the plants rather than an overhead system, which allows the water to evaporate before reaching the roots. With drip irrigation you get a very controlled method of delivering water directly to the plants without wondering if you are over or under watering them. At ProGreen Gardner we are proud to offer the finest lawn and plant drip irrigation services. We use nothing but quality products made specifically for low-volume irrigation systems in order to maintain healthy plants and save water at the same time. We use drip emitters, which are what the system uses to control the flow and direction of the water. These emitters, about the size of a quarter, are placed directly on the ground. Water is then released slowly and steadily providing a consistent drip so plants have a much less risk of either drying out or becoming over over hydrated. With all of our kits we use a standard irrigation valve along with a pressure-regulating filter designed for low volume systems. This way debris is filtered out to keep your system from becoming clogged while providing an even, consistent water pressure to your targeted plants. These low-volume watering systems reduce runoff and overspray for both turf and non-turf landscapes. Any extra water the roots do not need will sink into the soil just as it would following a rainstorm. We arrange the drip emitters in rows on the ground along the rows of plants and connect them to a feeder hose, which is then connected to a water source. We do offer the option of using feeder hoses that have drip irrigation built right into them and both ways work very well. The largest benefit of drip irrigation is the precision with which the water is delivered. With drip emitters there is virtually only one place water is going to go and that is directly into the soil down to the roots of that particular plant. The flow of water is controlled either faster or slower depending on the individual needs of the plants. Because of the precision and efficiency of this system water bills tend to drop significantly as an added bonus. If you are thinking of changing your landscape or laying down new turf you need to consider a drip irrigation system for affordability and efficiency. 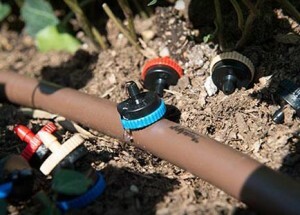 Contact us for a quote on installing a modern drip irrigation system that will meet your needs.